Renovated, a duplex of 60m2 in residence of standing 50 meter tracks and shops. Third and last floor with 3 bedrooms (3 double beds) 2 bathroom and 1 bathroom, 3 toilets. 2 large bedrooms upstairs (one with balcony) with 2 shower room and a small double bedroom with bathroom on the first floor. Well equipped kitchen with dishwasher, oven, micro wave, fridge and ceramic plate, living room with south facing balcony with flat screen tv and dvd, stereo and wifi. Discount on packages and ski equipment. Montalbert remains a typical Savoyard village in the Tarentaise Valley to spend an ideal holiday with family or friends. Perfect for all levels of skiing, this village is directly linked to paradiski with a level of elevation of 1350m to 3250m. With slopes facing north, and snow cannons installed in recent years, the tracks remain open until the closing of the stations. Montalbert is easily accessible from Aime 10km and 53 km from Albertville. SUMMER: BBQ, climbing, mountain biking; trial, rafting, canyoning, lake, mini golf, pony rides, paragliding shot the arc. Italy and Annecy 1 hour. One of the remaining family style villages of la plagne and joined to one of the largest ski areas in the world. 50 meters from slopes. 100 meters from ski school and cable car. 2 south facing balconies reduction on ski passes and ski hire. LAUNDRY RENT 40 euros PER BED CHECK DEPOSIT 500 EUROS ARRIVING GARAGE OPTION 65 EUROS DISCOUNTS ON PACKAGES AND SKI EQUIPMENT. Conforme à la description. Tres confortable. Tres propre. Tres bien agencé. Bcp apprecié l'attention à l'arrivée avec le pot d'accueil. Petit bémol ; on est au 3ème étage sans ascenseur ; pas toujours pratique notamment pour les bagages. Le séjour est fort juste pour 6 personnes, 4 est l'idéal. Un super séjour dans un cadre de rêve!!!! Très joli appartement dans un magnifique petit village!!!! Nous étions à deux pas du télécabine que nous n'avons pas manqué de prendre et le cadre est superbe!!! Nous sommes tombés amoureux des lieux!!! Nous reviendrons sûrement un jour!!!! L'appartement est top et très bien entretenu!!! Les chambres du haut sont super grandes et il y a beaucoup de rangements!!!! Juste pour trouver un petit point négatif, l'appareil à raclette est très abîmé mais il y a possibilité de s'en faire prêter un à la supérette du village!!!! Nous n'avons malheureusement pas croisé la propriétaire...à une prochaine fois peut-être !!!! Die Ferienwohnung befindet sich am Ende des kleinen Dorfes Montalbert in absult ruhiger Lage. Die Skipiste ist nur 50 m vom Haus entfernt und zu Fuß oder auf Ski leicht erreichbar. braucht. Parkplätze sind vor dem Haus reichlich vorhanden. Die Wanderwege beginnen gleich hinter dem Haus so daß es sich für Familien mit einen Hund besonders gut eignet. Die Übernahme und Rückgabe der Wohnung war in freundlicher Atmosphäre und ohne Probleme. Für den schönen Aufenthalt möchten wir uns bei den Besitzern bedanken und würden die Wohnung auch unseren Freunden empfehlen. Tina est adorable et met tout en oeuvre pour que le séjour se passe au mieux. At the heart of Montalbert la PLAGNE, in the residence "le signal", a large duplex of 60m2 with 3 bedrooms, 1 bathroom and 2 shower rooms. 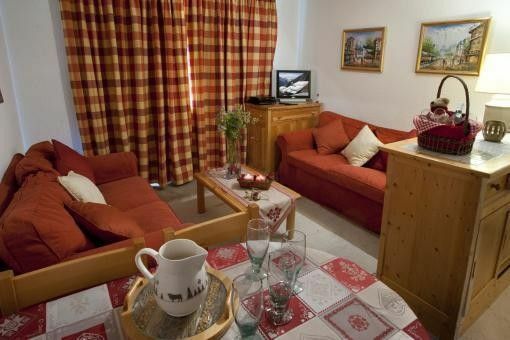 Renovated, this apartment is located about 50m from the slopes and 100m of gondola and the ESF. The two south facing balconies exhibitions allow you to benefit from an opportunity to sunbathe. It is possible with the rental to enjoy our rates on ski passes and on ski equipment rental. Montalbert remains a typically Savoyard village in the Tarentaise valley for the ideal holiday with family or friends. Perfect for all levels of skiing, this village is directly linked to paradiski with a level of elevation of 1350m to 3250m. With slopes facing north, and snow cannons installed in recent years, the tracks remain open until the closing of the stations. Montalbert is easily accessible from Aime 10km and 53 km from Albertville.